With two days in Austin, we wanted to tick off as many sights as possible. We decided to split the city into two – north of the river, and south – day one being our northern adventure. Before we flew out, the weather looked really promising – beautiful sunshine and a not-too-hot 25ºC. We packed t-shirts, sunglasses, and plenty of SPF for me. What a waste of time that was, because the temperature dropped to 8ºC and we were FREEZING. I had to buy a coat as we were completely unprepared – it’s Texas for goodness sake, it’s supposed to be hot! The consequence of this was that some of our walks were not particularly pleasant, and the rain got a little tiresome, but I suppose at least we weren’t walking around in the sweltering heat! Although we’d hired a car, we decided to get an Uber from The Domain down to the city centre as Husband didn’t feel like trying to find a parking space. It was a good decision as the traffic was crazy, so we just sat back to enjoy the half-an-hour ride. Our Uber driver was very confused by our first stop and checked with us a couple of times to make sure this was where we wanted to be. Oh yes, this was exactly where I wanted to be. 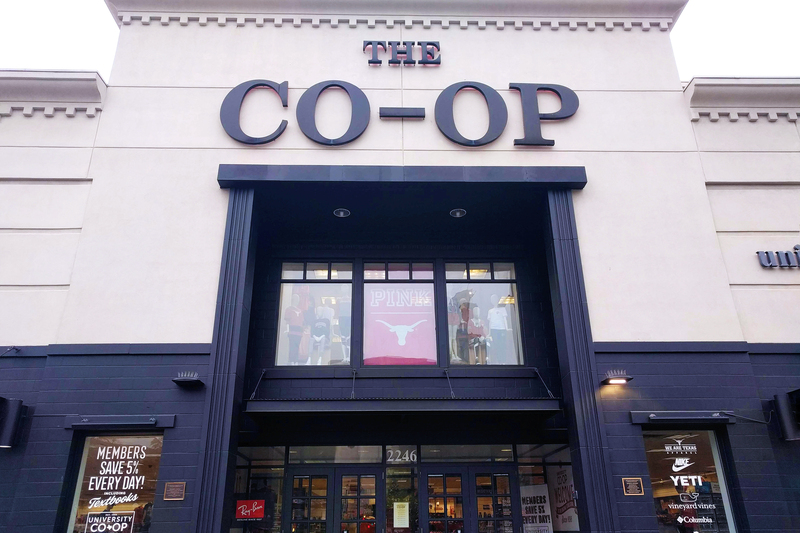 The Co-Op on Guadalupe Street is three floors of merchandise from the University of Texas – we’re talking flags, bumper stickers, sweaters, children’s clothes, even Christmas decorations. I bought a bauble. A BAUBLE! I am not ashamed to admit that this was my favourite store in the whole of Austin and we spent 45 minutes filling a basket full of Texas Longhorns goodies. I should have bought more. 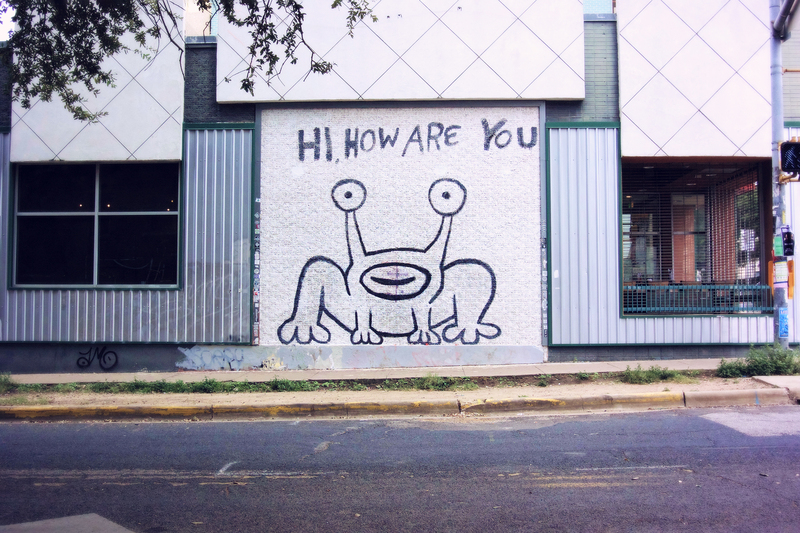 After my spending spree, we walked south towards the Capitol Building, stopping to take photos of Jeremiah the Innocent – an iconic mural by Daniel Johnston of a frog saying Hi How Are You. This was one of my Austin must-sees, but I can’t remember where I saw it first – I’m sure it’s appeared in the titles for a TV show I watched years ago, but no idea what that was. I’m pleased I’ve seen it in person now. 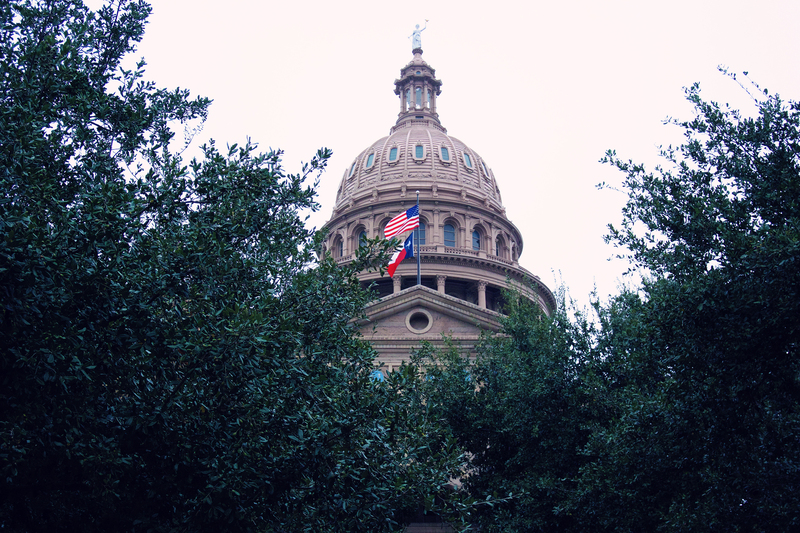 We wandered around the outside of the Texas State Capitol building for a while, taking photos from every angle. We were in Austin just days after the divisive mid-term elections which had initially worried us as we thought there might be some unrest, but there was no drama whilst we were there. The Capitol building and the grounds were very peaceful, quite impressive and imposing and we considered going on a tour – maybe if we had more time. As we sat in the grounds and watched the visitors (and squirrels), we scoured Google Maps for somewhere to get brunch. It was only 11am but we were a little peckish after skipping breakfast so we took a little detour to Walton’s Fancy and Staple on 6th Street. This was a deli/restaurant/florist and I fell in love with it. We got there when there was plenty of seating, but by the time we left it was packed – I’m so glad we got there early, as we would have missed out on their delicious sandwiches. After having the first of many debates with myself over whether to get a tote bag (a recurring theme pretty much everywhere we went), we continued our walk and ended up at the 6th Street Historic District. We were here to pick up some legendary Voodoo Doughnuts, and spent a good 5-6 minutes just deciding on what to get – their flavour combinations are phenomenal. The restaurant is cash only (I made sure I had plenty of $$$) and is open 24/7 – I hadn’t realised this prior to our visit and had spent the morning being worried that they’d sell out. After a really great chat with the guy behind the counter who seemed genuinely excited that we were from the UK, our choices were boxed up and we continued our adventure. 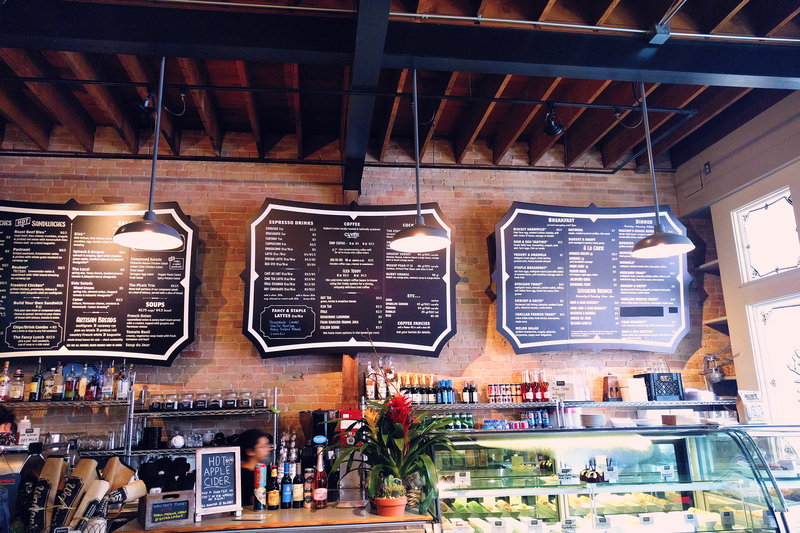 In all of the travel guides about Austin, people raved about 6th Street. We were there during the day, so we didn’t see it in all it’s neon glory, but honestly we didn’t want to hang around for too long. It felt kind of… sketchy, and this is coming from someone who has hung out in some very sketchy places. Neither of us felt particularly comfortable, so we quickly took some photos and wandered further towards the river. We didn’t want to cross the river today as that was scheduled in for day two, so instead we walked west down the hiking trail. It started to rain ever so lightly and the wind was picking up a little, so after a quick Google, we decided to find a place to get some snacks and head back to the hotel. We cut up West Avenue and found the most amazing building – the Turbine Generator Building of the Seaholm Power Plant. The whole area has been turned from a decommissioned power station into a new neighbourhood full of residences, shops, and restaurants, and is just a delight to walk around. I really liked the energy and the atmosphere here, and whilst a few of the retail units are still empty, it definitely has promise. We popped into the nearby Whole Foods which was very exciting (for boring people like me) because it’s the original one, dating back to late 1970s. If you like Whole Foods, I highly recommend a visit, but I admit that it’s not going to be top of many people’s list. We picked up some water and other fun snacks, then Uber’ed back to our hotel room (with a driver who was not happy about going to The Domain). Back in the hotel room, we feasted on our Voodoo Doughnuts before having a quick wander around the rest of The Domain. We did consider going back downtown for dinner that evening, but having walked almost 20,000 steps, we decided to stay local for the night. Should have got more doughnuts though.